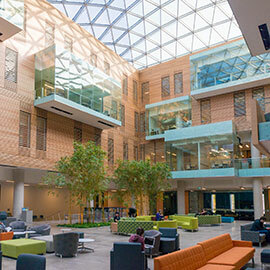 Lazaridis Hall will be open on Wednesday, April 19 from 6 a.m. – 4 p.m. and the Lazaridis Hall Atrium will be closed all day. We’ve opened up extra study space across campus from 8 a.m. – 11 p.m. in the Turret and Senate and Board Chamber as a result. Note: Anyone with key fob access to the building will be able to enter after 4 p.m.
Study space: 400 seats, 60 tables (more once construction is completed) throughout all four floors, including LH3104, atrium, café, etc. We are all responsible for keeping this new building at its best. Please be mindful and respectful of the space and its occupants, and please be patient while we are working to build the best business school building in Canada. If you have any questions, please don’t hesitate to ask the Undergraduate Programs Office (LH2058) or the Dean’s Office (LH4113).